TELEFONÍA MÓVIL Y TABLETS Hay 1 producto. 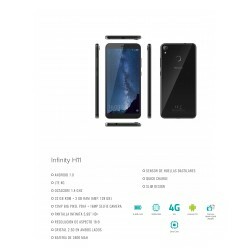 Smartphone Hisense Infinity H11, Octacore SnapDragon 430, 5,99" 18:9 HD+ IPS Full Lamination 2.5D, sensor de huellas, brújula, 3 GB, 32 GB, Dual SIM, BT 4.2, Wifi b/g/n/AC, GPS, FM Radio, 16 MPx + 12 MPx DFlash, USB type-C + 3.5 mm jack, 3.400 mAh con carga rápida, earphones, Android 7. Protector incluido.